Verizon Wireless and LG today announced the Intuition, a rebranded version of the LG Vu, which has a 5-inch display with a 4:3 aspect ratio and 650 NIT brightness rating. Similar to the Samsung Galaxy Note, the Intuition offers a note-taking application called QuickMemo, which can be used with the Rubberdium pen (a.k.a., stylus) to write directly on the screen and interact with applications. The Intuition supports near-field communications, and ships with several smart tags, called LG Tag+, for initiating select actions on the device, such as turning on/off the Bluetooth, GPS, and Wi-Fi radios. The Intuition will ship with Android 4.0 Ice Cream Sandwich and is powered by a dual-core 1.5GHz processor and 1GB of RAM. Other features of the Intuition include an 8-megapixel main camera, 1.3-megapixel user-facing camera, Bluetooth 3.0, Wi-Fi, GPS, and mobile hotspot. 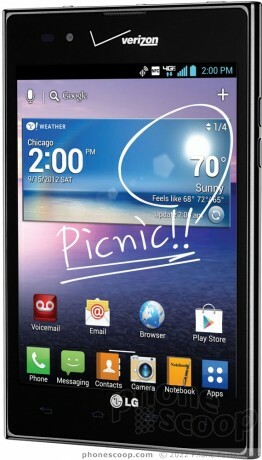 The LG Intuition will be available online starting September 6 and in stores September 10 for $199.99 with a new two-year contract. LG and Verizon Wireless offered a first look at the Intuition today. Will consumers flock to this 4G phablet? For once we have a good example of a bad implementation, and there are no bluecoyote comments pointing out how bad this phone is. I guess a phone is only worth trashing if it is nearly flawless and stands to cause Apple lots of trouble. Well I do think the fact that LG is no longer copying the iPhone but now copying the Galaxy Note is a sign that Apple is losing its mojo. Oh thank god I wasn't the first person who had to say this. More power to them though, it would be nice to see more devices like this on the market. Looks like the Note 2 is still the only option.